With Australia’s new carbon tax laws having been passed by the Senate last week, now is a perfect time to look at Victoria’s three major coal fired power stations. Located in the Latrobe Valley atop massive reserves of brown coal, together these power stations run 24 hours a day to supply the majority of Victoria’s baseload electricity demand, and in the process contribute more than their fair share of emissions in the environment. Under the carbon tax it is proposed that the most polluting of the trio will be shut down: so why are they so dirty? 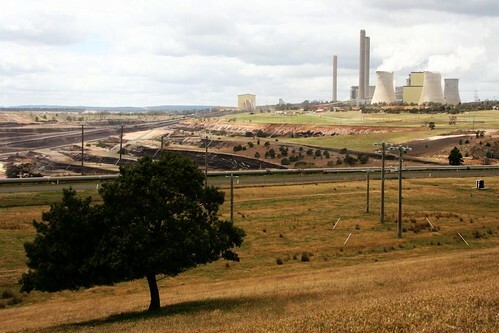 Considered the lowest grade of coal, the brown coal found in abundance in the Latrobe Valley has an extremely high moisture content of 60 to 70 percent, compared to the 10 percent found in NSW black coal, resulting in a much larger quantity of coal needing to be burned to produce a given energy output. This moisture content also results in higher carbon dioxide emissions then comparable black coal plants, which has attracted the attention of modern environmentalists. With no economic deposits of black coal found in Victoria, the use of brown coal for power generation commenced in 1924 under the auspices of the State Electricity Commission of Victoria, with the opening of their first power station at Yallourn in the Latrobe Valley. With the low energy density making brown coal expensive to transport, the power station was built beside the open cut mine and fed with coal by a conveyor belt, in a model which is still used throughout the Latrobe Valley. The SECV went on to use their position as the monopoly electricity generator and supplier to drive aggressive growth in electricity usage, assisting electricity hungry industries such as aluminium smelting to become established in the state, and planning new open cut mines and power stations years in advance to cater for the ever growing demand. While the widespread use of brown coal for power generation enabled Victoria to become self sufficient in energy supplies and encouraged the growth of heavy industry, this was achieved during a period when the costs of pollution were not a mainstream concern and the environmental movement was still to emerge. It took until the late 1980s for the SECV to change direction towards a less energy hungry future, but it was Jeff Kennett and his privatisation bandwagon that dismantled the Commission, breaking it up into the current collection of generation, transmission and retail companies during the 1990s. Today the oldest baseload power station in Victoria is the 1,600 MW capacity Hazelwood Power Station. Located just south of Morwell, Hazelwood and the neighbouring open cut coal mine that fuels it were constructed on a greenfields site between 1964 and 1971. Planning at the site commenced in 1949 for both power generation and briquette production, with the SECV starting construction in 1959 on the first of six 200 MW generating units. With increasing electricity demand in Victoria by 1963 it was decided to add two more generating units, taking the total to the eight. 40 years after opening Hazelwood is now a polluting dinosaur, but at the time of opening it was the first of Victoria’s “modern” power stations, being both cleaner and cheaper to operate than anything that had come before due to the then-massive scale, with each generator having four times the capacity of the largest previously used in the state. With privatisation of the SECV, Hazelwood was sold to the UK based International Power plc in 1996 for a massive $2.35 billion. If this sale price is not unbelievable given the age of Hazelwood, at the time of the sale the associated open cut mine that fuelled it had only 10 years of coal left inside the approved mining licence boundaries, effectively placing a closure date on the plant. However this was not to be, when the State Government approved the Phase 2 “West Field” development in 2005, expanding the mining area across the Morwell River to secure a coal supply until 2030. At least with the introduction of the carbon tax it appears that the power station will never reach age 60, with Hazelwood a frontrunner to be included in the 2,000 MW of generating capacity paid to shut down. Not a bad deal for the private owners, eh? 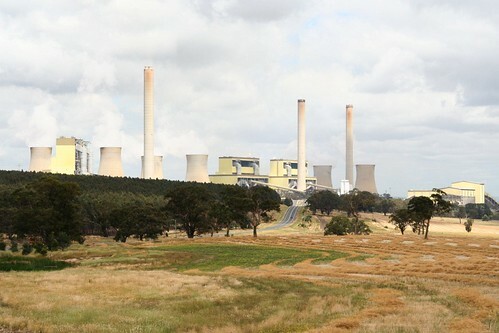 The next oldest power station in the Latrobe Valley is the 1,450 MW Yallourn Power Station, located between Moe and Morwell on the banks of the Latrobe River. Commissioned between 1973 and 1981, Yallourn is the site of Victoria’s first brown coal fired power stations. The open cut mine at Yallourn commenced operations in the 1920s supplying brown coal for both electricity generation and briquette production, with employees living in the neighbouring company town of Yallourn. In the decades that followed more power stations were built and the open cut continued to expand towards the town, so in 1969 the SECV announced that Yallourn would be cleared to make way for further expansion of the mine. With all of the land in the town owned by the SECV and rented out to tenants, demolition commenced soon after, with the entire town wiped off the map by 1982. With privatisation of the SECV Yallourn was sold a consortium of companies in 1996 for $1.55 million, who onsold it to the Hong Kong-based CLP Group, operating as TRUenergy. As the lifetime of the power station is dependant on coal from the neighbouring open cut, with various expansions of the mine having been carried out in recent years to secure the supply. With the coal beneath the former township of Yallourn exhausted by the 1990s, the East Field expansion opened on the other side of the mine, requiring a diversion of the Morwell River. With further diversions carried out in 2007, the coal supply at Yallourn is now secure until 2032, when the oldest generator will be 59 years old. The final and largest brown coal fired power station is the Loy Yang complex, located south-east of Traralgon beside yet another open cut mine, with a total of 3,300 MW generating capacity spread across two power stations, commissioned between 1984 and 1996. 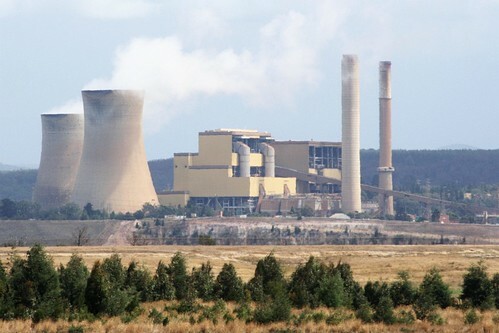 With Victoria’s electricity demand growing throughout the 1970s and the output of the existing open cut mines at Morwell and Yallourn fully committed to the power stations mentioned earlier, the SECV looked for new brown coal reserves to exploit for power generation, setting on a location outside Traralgon. The initial plans for Loy Yang made it the biggest project ever attempted by the SECV, with a total of 4,000 MW in generating capacity spread over four 500 MW stages, forming the Loy Yang ‘A’ and ‘B’ stations at a cost of around $5.5 billion (in 1984 prices). The scale of the plant at Loy Yang was driven by the State Government chasing the electricity hungry aluminium industry, with discounted electricity rates leading Alcoa to sign a contract in 1979 for the construction of a 480,000 tonne/year smelter at Portland on the state’s south-west coast. 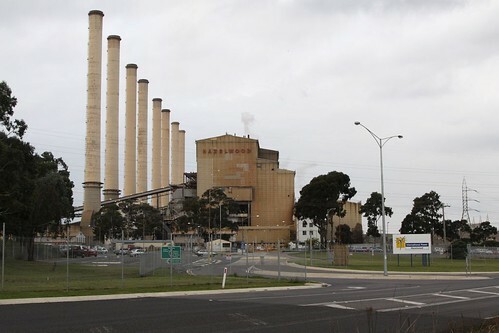 Finally opened in 1986 after many disputes and a downsizing in capacity, the 300,000 tonne/year capacity smelter requires 700 MW of power after transmission losses are taken into account – around half of the output from the ancient Hazelwood power station. The first power at Loy Yang ‘A’ was generated in 1984, with the last of the units being brought online by 1988. By this time the electricity industry in Victoria had changed, and work on the next stage at Loy Yang ‘B’ stalled for a number of years, as a new focus on energy conservation reduced overall electricity demand, and questions were asked in government as to the cost efficiency of the SECV and brown coal power generation in general. It took until 1993 for this situation to be finally resolved, when 1000 MW of the Loy Yang ‘B’ plant was cancelled, and the two unfinished units being sold for $2.3 billion to a private owner, who completed them in 1996. One year later in 1997 Loy Yang ‘A’ was also sold to private enterprise, with the 10 year old power station fetching $4.75 billion. 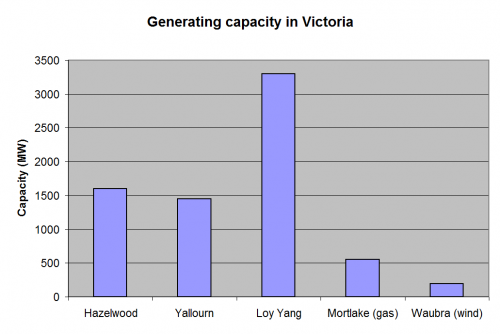 Fifteen years since Loy Yang ‘B’ opened, Victoria has not gained any new baseload generating capacity, despite an extra 4.5 million residents moving to Victoria, and air conditioners popping up in every household. With privatisation power generation is now the domain of risk adverse investors, who are not excited by the huge upfront costs and low return on investment associated with a new power station. Of the investments in generating capacity that have made, ~500 MW gas powered peaking plants dominate, followed by wind farms chasing government mandated renewable energy targets, and rooftop solar panels heavily subsidised by feed-in tariffs and government grants. So how much generating capacity is needed to replace a baseload coal power station? Mortlake Power Station is a $640 million, 550 MW capacity gas powered “peaking” plant, that only operates in times of high electricity demand. Waubra Wind Farm is the largest source of renewable energy in Victoria, with 128 wind turbines providing a total capacity of 192 MW for $450 million. As you can see by the graph, Victoria has a long way to go if we want to eliminate the use of brown coal completely. Getting rid of Hazelwood will require $1.5 billion of new gas powered generators to be built, and replacing Yallourn and Loy Yang will as well take another $6 billion of plant. The wind equivalent will require a minimum $15 billion capital investment, and this is ignoring the difference between ‘sticker’ capacity and actual output of wind turbines. « What’s going on at Southern Cross Station? I can see the ramifications of privatising gas and electricity. Living 250 kms from Melbourne, our electricity costs are more than our mortgage. Did the SECV have plans to look at renewables before it was sold? The ‘Victorian Solar Energy Council’ existed back in the 1980s – in conjunction with the SECV they erected a wind turbine at Breamlea, which still in service today!